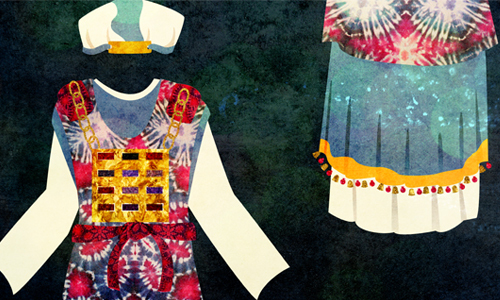 The breastplate (choshen) was one of the eight priestly garments worn by the high priest (kohen gadol) when serving in the Holy Temple. It featured twelve precious stones, corresponding to the 12 tribes of Israel, and served as a medium through which G‑d provided direction to the Jewish nation. The breastplate1 was perhaps the most conspicuous of all the eight priestly garments worn by the high priest. It consisted of a rectangular piece of fabric, two zeres2 long and one zeres wide, folded over to create a square. The fabric was fashioned from five materials: gold that had been flattened and cut into thread-like strands; wool dyed techelet (blue3); wool dyed argaman (purple4); wool dyed scarlet5; and linen. To create the cords used to weave the breastplate, a single strand of gold would be spun with six strands each of techelet, argaman, scarlet and linen. The four seven-strand threads would then be twisted together, forming 28-strand cords. The breastplate inspired the name for the section of Jewish law devoted to judicial affairs, known as Choshen Mishpat. Read more: Twelve Tribes—Twelve Paths. Ruby and Reuben. Reuben sinned by transposing the beds of his mother Leah and his father’s concubine Bilhah.20 The ruby’s red color represents the shame Reuben felt when admitting his misdeed. Prase and Simeon. The tribe of Simeon sinned with the daughters of Moab and Midian,21 causing their faces to turn pale, adopting the greenish tinge of prase. Carbuncle and Levi. The tribe of Levi devoted themselves to transmitting the teachings of G‑d to their brethren.22 The carbuncle’s brilliant sparkle symbolizes the Torah’s spiritual radiance. Sapphire and Issachar. The tribe of Issachar was renowned for its greatness in Torah study. They are therefore associated with sapphire, the material from which the two tablets were formed. Pearl and Zebulun. The tribe of Zebulun engaged in commerce, amassing great wealth. The white pearl resembles the color of silver coins. Turquoise and Naphtali. In days of old, turquoise was commonly carried by members of the cavalry. The closeness between the rider and his horse is associated with the name Naphtali, Hebrew for connection. Crystal and Gad. Just as crystals are widespread minerals, the tribe of Gad were numerous and well-known. Chrysolite and Asher. Chrysolite takes on the complexion of olive oil, a substance found in abundance in the land of the tribe of Asher. Jasper and Benjamin. After Joseph’s sale into slavery by his brothers, Benjamin—who was not present at the time—deliberated whether or not he should reveal his brother’s whereabouts to his father, Jacob.26 This back-and-forth internal dialogue is reflected in jasper’s numerous colors. Kabbalistic sources explain that the high priest, the nation’s representative in the Holy Temple, was able to effect a positive change within the people through his service. The garments he wore likewise possessed great spiritual energy and influence. Gemstones are inanimate matter, yet they shine and impart radiance. The stones of the breastplate thus empowered the Jews to refine their coarse animalistic souls and make them shine. (Listen: Who Is the Real I?) Similarly, words of prayer may on their own be “inanimate,” but through imbuing them with feeling, each word becomes a dazzling gem. Unless otherwise noted, the information in this section is taken from Exodus ch. 28 and commentaries. A zeres is half a cubit (approximately 9.5 inches). Techelet is wool dyed with the blood of the chilazon, a rare marine creature whose identity and present existence has been, and is still, widely disputed. The exact hue of the dye (blue or purple) is a matter of dispute as well. Read more: What Is Tekhelet (Techelet)? The exact coloration of argaman is a matter of dispute. See Mishneh Torah, Hil. Klei Hamikdash 8:13, and Ibn Ezra, Exodus 25:4, who state that it is red. Elsewhere Maimonides himself defines argaman as lac, which is purplish-red. Cf. glosses of Raavad on Hil. Klei Hamikdash ad loc, who posits that argaman is a tri-colored fabric. See Mishneh Torah, Hil. Parah Adumah 3:2. See Rashi, Exodus 26:1 and 26:31. Others say they were arranged in three rows and four columns (Minchat Chinuch, mitzvah 99). Alternatively, the last two words were shivtei Yisrael, “tribes of Israel” (Jerusalem Talmud, Yoma 7:3) or shivtei Kah, “tribes of G‑d” (Mishneh Torah, Hil. Klei Hamikdash 9:7). Talmud, Yoma 73b. Some say that the patriarchs’ names were written above Reuben’s name, while the latter two words were written below Benjamin’s name (Mishneh Torah ibid.). Others maintain that the added letters were interspersed among the names of the tribes, resulting in six letters per stone (Rabbi Bachya ben Asher, Exodus 28:15. See Hebrew diagram below). According to an alternative view, the breastplate did not include such an inscription (see sources referenced in Likkutei Sichot, vol. 11, p. 135 fn. 12, and p. 136 fn. 16). Mishneh Torah, Hil. Klei Hamikdash 9:10. Mishneh Torah, Hil. Klei Hamikdash 10:11–12; Nachmanides, Exodus 28:30. Talmud, Yoma 21b and Sotah 48b. Rashi, Exodus 28:14 and 28:30. Rabbi Bachya ben Asher, Exodus 28:15. English translations are based primarily on The Living Torah (Kaplan), pp. 420–423 and notes. The identity of Rabbi Bachya’s definition of leshem is unclear. The added letters following the names of the tribes comprise the words shivtei Yeshurun (see fn. 9). 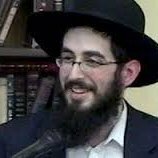 Rabbi Bachya ben Asher, ibid. Genesis 35:22 and Rashi ad loc. For more on Reuben’s sin, read: Spirituality vs. Leadership. See Rashi to Genesis 49:9. See Bereishit Rabbah 71:5. Ultimately he refrained, realizing that G‑d, too, wanted Joseph’s whereabouts to remain concealed (Matnos Kehunah ad loc). Ohr Hatorah (Rabbi Menachem Mendel of Lubavitch), Shemot, vol. 5, pp. 1656ff.